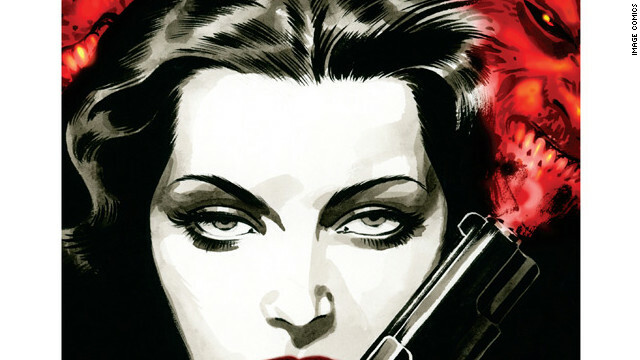 "Fatale #1" from Image Comics comes with an amazing pedigree. This is something that Daniel Dean from Titan Games and Comics in Smyrna, Georgia, and I can agree on. Dean and I are both fans of supernatural horror/crime stories that follow classic film noir conventions in the vein of the television show "Supernatural" or Jim Butcher's "Dresden Files." This comic book adds to that mixture with a narrative that jumps through multiple time periods and is told from the point of view of many different characters. But if comic book bibliographies were criminal rap sheets, Ed Brubaker and Sean Phillips - writers of "Fatale #1' - would be the FBI's two most wanted. Together, on books like "Incognito," "Sleeper" and "Criminal," the duo has shown readers the world as seen through a criminal's eyes, by using the conventions of a wide range of different fictional genres. Each of these comic books has been an absolute home run from Brubaker and Phillips. Dean thinks Brubaker can do little if any wrong and said that his talents, "made me care about and enjoy 'Catwoman' several years back." The series is slated for 12 issues in its current season. Brubaker and Phillips's track record is enough to make us hope "Fatale" gets a second one. We are both excited about this launch more than about anything else this week, and there is some fabulous stuff out this week. Dean was right-on when he said, "If you're still on the fence, I have only two words for you: Mobster Cthulhu." So, until next week, go forth and read, my people, and the reading will be good! Is there a comic out there that you really love? Let us know in the comments. We’re always looking for tips on good comics. Here are some of the comics scheduled to hit the shelves on January 4, 2012. Your local retailer will probably have these and others, so make sure to check with them for more details. Keep in mind, folks, that because of the holidays this week some shops may not be getting your new books in until Thursday. Call ahead if you're not sure. During a brief interest in comic books in the 1990's, it seemed that Image put out about a trillion flashy #1 issues for many, many comic book ideas that didn't merit issue #2. The phrase "all Image and no substance" was parroted by my comic-savvy friends after I wide-eyed bought up a ton of #1's while daydreaming of ballooning re-sale value. In short, a new comic book by Image is probably not news-worthy, even if you love the artwork and underlying story. In the twenty years since then, Drowlord, Image has mostly reinvented itself as a large company that provides independent comic creators with a larger publishing base than they can get on their own. They dabble in most of the genres out there, from superhero comics to horror to science fiction. Fatale in particular is a noir story in the vein of Brubaker and Philips's crime comics under Marvel's ICON label, like Criminal, which I believe was nominated for several awards. It's a pretty big deal for comics fans and the book itself is very good. Chris, thanks! And so cool to see some of your wriintg in the Lesley Alumni newsletter!Tyson, name me one person who doesn't!Brian, I'll be posting some more, but unfortunately at this point, I can't post the whole thing, at least until it's published.Bruna, ha, thanks! I let myself go on the dialog. I wish I could speak like that all day. I would you know.Doug, more to come! this just means there's less of a chance for me to get into the sd comic con this year, now that comics are all the rage. these last 13 years have been a blast. i'll miss it.